Silky shark, Carcharhinus falciformis, is a species of requiem shark named for the smooth texture of its skin. Large and slender shark, the silky shark is characterized by a moderately extended, rounded snout, a relatively sloping first dorsal fin with a blunt apex that originates behind the free margins of the pectoral fins. They have a small second dorsal fin with an extremely long free rear tip (more than twice the height), and a low inter-dorsal ridge. Pectoral fins are long and slender, typically with dusky tips. The skin is densely covered by minute, overlapping dermal denticles. Each of the dermal denticles is diamond-shaped and bears horizontal ridges leading to posterior marginal teeth, which increase in number as the shark grows. The back is metallic golden-brown to dark gray and the belly is snowy white, which extends onto the flank as a faint lighter stripe. One of the larger members of its genus, the silky shark commonly reaches a length of 2.5 m (8.2 ft), with a maximum recorded length and weight of 3.5 m (11 ft) and 346 kg (763 lb) respectively. Females grow larger than males. The maximum lifespan is 22 years. Silky sharks favor warm, tropical waters worldwide. They are the most common shark species of the “Pelagic Zone”, the continental shelves with depths of 500 meters or more (1,640ft). But often times, they may be seen near the surface as well. In the Atlantic Ocean, they are found from the U.S. state of Massachusetts to Spain in the north, and from southern Brazil to northern Angola in the south, including the Mediterranean Sea, Gulf of Mexico, and the Caribbean Sea. Unlike the Caribbean reef shark, they mostly swim over deeper waters. They are fast swimmers and are usually seen hunting large formations of tunas. These predators have a perfect and effective hunting behavior. They dive together in large groups of fish and attack them with lighting fast speed and wide open mouths. They truly present a beautiful sight to any shark enthusiast with their elegant lines. On Cat Island, where we frequently encounter the silky sharks, the population is young and therefore the sharks are smaller than found elsewhere. 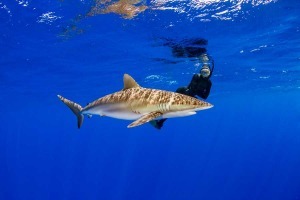 We do often encounter groups of silky sharks, ranging from several animals up to twenty.